Rented REAL STEEL from Pay-Per-View. What can I say? Any movie with Hugh Jackman in it is worth watching. As you know, I have a terrific crush on this guy. He has lived in my head through every ANNA JEFFREYromance novel I’ve written. Sometimes his hair has been brown, sometimes, blond, etc., etc. But he’s always the same guy. I found the movie enjoyable. It held my interest all the way through it, which is unusual. With most movies, I only stick with them up to the half-way point. It’s set in the near future. A long time ago, I was a sci-fi fan and I enjoyed stories set in the future. So here it is: Boxing and ring fighting with mere humans has become too tame. Human athletes have been replaced by giant robots. 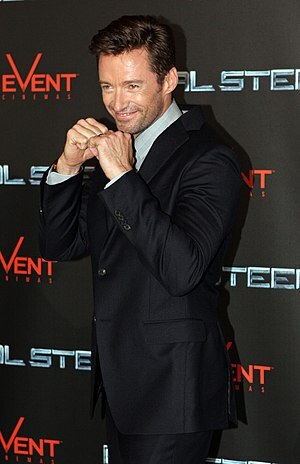 Hugh Jackman plays Charlie, an ex-boxer who missed his shot at the title because of robot developers and promoters taking over fighting. Charlie has made all the wrong choices and is down on his luck in a big way. He’s struggling to make it by piecing together robots from scrap metal and junk heaps to make a little money in the underground robot fighting. Somewhere back in time, about 11 years ago to be precise, he left behind a son. The boy’s mother dies unexpectedly, leaving him without a parent. The deceased mother’s sister is married to a wealthy older man and she wants custody of her nephew. But the court is about to hand over custody to his father, Charlie. Before the wealthy husband will let that happen, he steps forward and in a private meeting, offers to buy the boy from Charlie. Charlie has no relationship with his son and he can’t resist the money. He agrees to the sale, but since the soon-to-be-new parents of the boy are set to take a trip to Europe, they ask Charlie to watch out for him for the summer. The kid is familiar with robots and video games, so he gets into the robots in a big way. He follows Charlie on an adventure into the underworld of robot fighting. Charlie spends the money he got for selling his son on a super-duper robot that’s supposed to defeat all comers. But it was built in Japan and only understands Japanese. They try to re-program it to understand English, but as you might expect, everything goes haywire in the first fight, the languages get crossed up and the expensive robot that Charlie spent all of his money on is destroyed. Charlie is ready to throw in the towel, but the movie doesn’t make clear what throwing in the towel means from his perspective. Meanwhile, his son finds a discarded robot in a refuse heap of old robots and persuades Charlie to help him bring it back to life. And the rest is history. The rag-tag robot becomes a big winner of an important fight against a supposedly un-beatable opponent. Charlie establishes a relationship with his son. It’s actually an underdog story we’ve seen or read a thousand times. Think Rocky Balboa. Hugh Jackman does a good job portraying Charlie. But then, as far as I’m concerned, this man can’t play a bad role, so I’m a little biased. I didn’t know the child actor’s name, but he was good, too. All-in-all, it was a better movie than you might expect it to be.